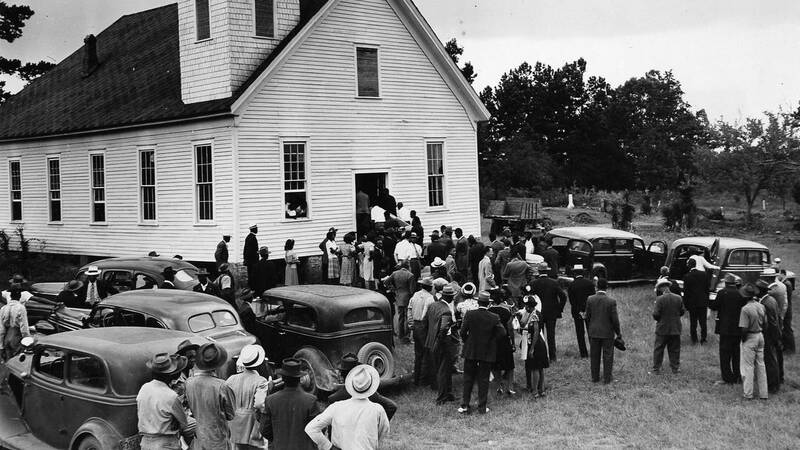 A federal appeals court has ordered the release of transcripts from secret grand jury proceedings dealing with a 1946 race-fueled quadruple slaying that many historians consider the last mass lynching in America. Activists have for decades sought justice in the Moore's Ford killings of four black sharecroppers at the hands of an angry white mob in Walton County, Georgia. They've employed actors to re-enact the grisly attack. During the annual portrayals, the killers drag the sharecroppers from a car, line them up and open fire, using firecrackers and ketchup for effect. Numerous books have been written about the killings, including "The Last Lynching: How a Gruesome Mass Murder Rocked a Small Georgia Town" by author and historian Anthony Pitch, who petitioned the court to unseal the records. Grand jury transcripts typically remain secret, so as to encourage witnesses to be forthright, but the 11th US Circuit Court of Appeals determined in its Monday ruling: "Exceptional circumstances exist when the need for disclosure outweighs the public interest in continued secrecy." Leaning on previous rulings that found federal "district courts have inherent authority to disclose historically significant grand jury records," the court noted Pitch's assertion that the lynchings were the catalyst for President Harry Truman's Committee on Civil Rights, created the same week the grand jury convened. The panel also considered that no one has been charged in the killing, no one is under investigation, no suspects have objected to disclosing the files and all the parties were adults when the grand jury met in late 1946, according to the ruling. The US Justice Department, which has fought to keep the records under seal, declined to comment. Pitch said he was "over the moon" after learning of the decision. He declined to speculate on whether the government might appeal the latest ruling but said he's not concerned by the prospect. "All kudos and plaudits must go to my lawyer, Joe Bell. ... He put years of time and effort into this, and the outcome is due to his persistence and dogged research," Pitch said. "I have every confidence that my lawyer will ultimately succeed. He already has two court victories under his belt." The cold case has been opened and closed over the years by local, state and federal law enforcement entities. Most recently, the Georgia Bureau of Investigation closed it in January 2018 without any arrests. The story begins on July 14, 1946. According to an FBI synopsis, Roger Malcom was jailed that day after stabbing a white farmer -- Barnette Hester, whom Malcom suspected of having slept with his wife, Dorothy -- in the chest. "Everyone knew Roger was going to die. That was automatic," activist Bobby Howard told CNN in 2007. Eleven days later, another farmer, former Ku Klux Klansman Loy Harrison, took Dorothy Malcom, George Dorsey and his wife, Mae Murray Dorsey, with him to bail out Roger Malcom, the synopsis says. Harrison paid $600 bail and said he wanted Roger Malcom to pay back the debt working on Harrison's 1,000-acre farm, though federal authorities at the time were suspicious of the well-known bootlegger's intentions. On the way back to his farm -- using a route authorities noted was not the most direct -- Harrison's car was stopped by at least a dozen white men who pulled the Malcoms and Dorseys from the car, dragged them down a wagon trail, beat them and shot them repeatedly. Estimates over the years have pegged the mob at between 30 and 100 participants. Harrison later told investigators that he recognized no one in the mob, according to the FBI file. The case caused such national outrage that Truman sent the FBI to Monroe, about 40 miles east of Atlanta, but witnesses and suspects stonewalled investigators, who were left to surmise that their efforts to solve the case might not trump a countywide effort to obfuscate it. As Georgia State Patrol Maj. William Spence told media outlets at the time, "The best people in town won't talk." What might the transcripts contain? In its opinion, the federal panel ruled Monday that one factor spurring it to unseal the transcripts is that "there is no indication that any witnesses, suspects, or their immediate family members are alive to be intimidated, persecuted, or arrested." James Graham, a US District Court judge from Ohio designated to sit on the panel, wrote in his dissenting opinion, however, that the argument did not persuade him because the descendants of those named in the file could suffer repercussions. "I am unable to dismiss the reputational harm that could occur to a living person if the grand jury transcripts reveal that their parent or grandparent was a suspect, a witness who equivocated or was uncooperative, a member of the grand jury which refused to indict, or a person whose name was identified as a Klan member," he said. Graham also wrote that he was disturbed that the 11th Circuit chose to unseal the files without reviewing their contents. Pitch conceded that he does not know what is in the files, but he suspects that the transcripts -- which document 16 days of testimony -- contain something "explosive." That suspicion is only bolstered by numerous officials telling him over the years that the transcripts didn't exist, he said. The 11th Circuit pointed out that Pitch's initial 2014 petition to open the files failed because there was no evidence they existed. It wasn't until 2017, after Pitch's book was published, that he discovered evidence they were being stored at the National Archives in Washington. Pitch can provide "the shelf number and everything," he said. The Justice Department has 45 days to file an appeal, and if it does, Pitch said, his attorney will be ready: "He has done so much work on this, he will give the fight of his life to the US Supreme Court." Asked why this particular chapter of the civil rights movement is of such interest, he said he's fascinated by American history -- "warts and all; this is the warts" -- and he doesn't believe one can fully understand what makes the country great without understanding its darkest moments. "This period of targeting black people without due process, without trial, without all these witnesses -- they executed them with vigilante justice, and that's horrific," he said. "I want to get to the bottom of this because I was hoping someone's conscience would work on them and (they'd) make a deathbed confession, and they didn't. They've taken the stories to their graves."